AGES: If you're under 5, kids will need help. 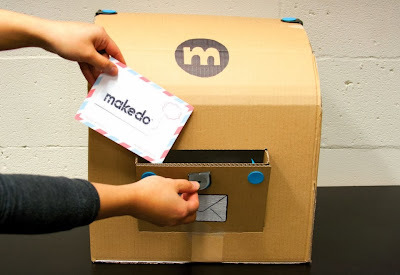 I think that now more than ever, we need a product like Makedo. If you don't have one, read why I think you should get it ASAP. So here's the thing: we are always talking about saving the earth, saving energy, saving the economy, saving the trees, but do we ever talk about saving creativity? Well, maybe we do since the resistance against standardized testing seems to be growing... (not fast enough tho... but I'm getting off-topic). Make something because snacks taste better when you sit in whatever you made. You can make a house and then make it bigger. Why not? Who Should Learn How to "Make Do"? You First? 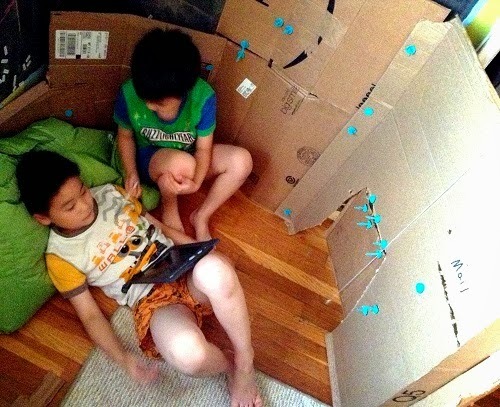 Here is an idea... Could it be that the grown-ups (NOT the kids), are the ones who have to "make do." We are the ones who have to make do with current circumstances and show our kids how to let them be themselves despite it all. It's not their fault that they have all these demands being placed on them. I can't believe the things I hear these days. Kindergarteners being given hours of homework, some of it is typing homework! As parents and educators, we have to make decisions that help them juggle their enormous responsibilities. And that is the essence of "making do" to me. We (the grown-ups) have to model making the best of things. This is the greatest reward. 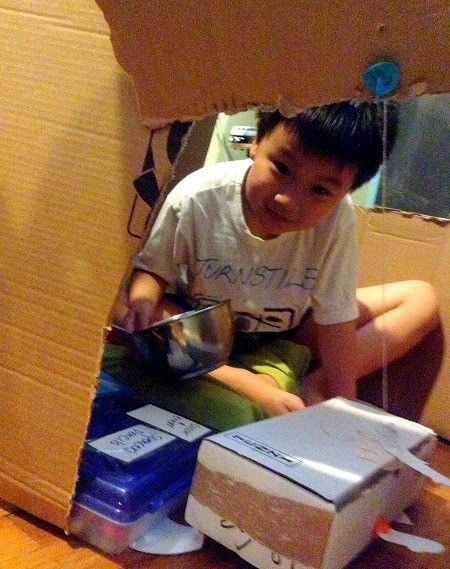 Chilling out in your own Makedo space. 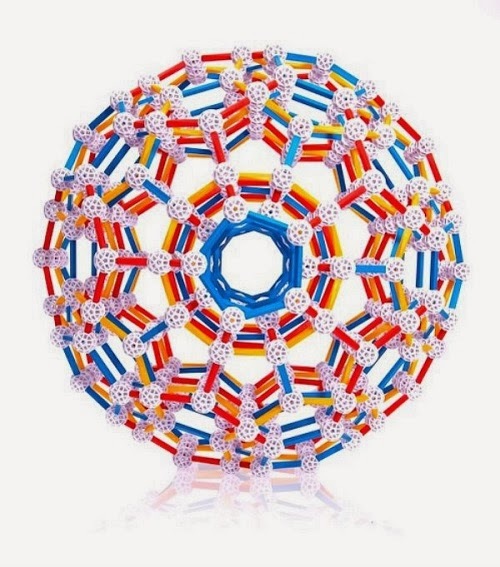 What could be better than a toy that makes toys? Huh, Did You Just Tell Me to Go Away? The contents of every Makedo box allows us to help children to do just that. Kids may play with boxes, they all do. They might even draw on it or attach things to it with duct tape. 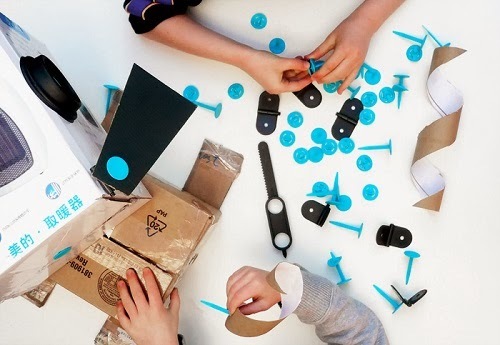 But with Makedo's re-usable tools, you essentially take something very necessary out of the equation. they don't need you to cut cardboard. 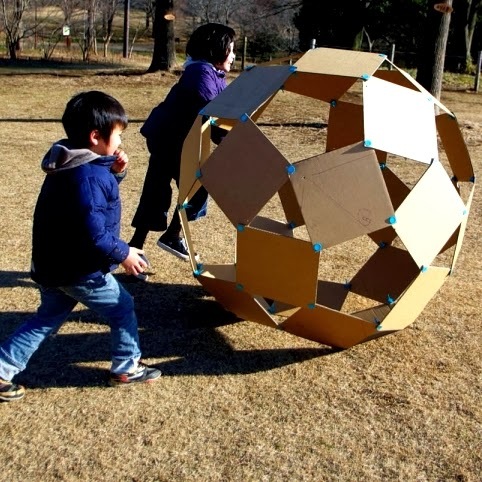 The Makedo saw cuts cardboard but not fingers. they don't need you to puncture anything. Makedo has a safe hole-maker. they don't need you to supervise them tearing off pieces of tape because you know those tape dispensers are SHARP! Nope, Makedo can help you connect and disconnect things. they don't need you to advise them on wasting or breaking stuff. You've got a lot of cardboard. Love things with eyes! So social! 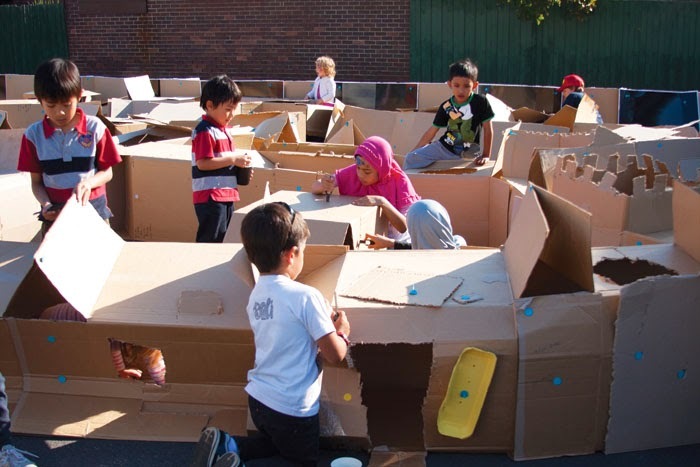 There is a new line called Box Props that offers kids an opportunity to build more narrative to their building play. You might look at it and think, hey, that is too... what #5's mom likes to call... "One-Note." And I admit, I thought the same way but for me, I think so much can be done with the People, Pets, Monsters, and Robots kits because they have eyes! Eyes say a lot! I love using the "scru"s to place parts wherever I want. A slight turn of the scru and you can make a face go from cheerful to looney. This orange thing is called the Scru. It's new and it's brilliant. You can put stuff to hang on it. 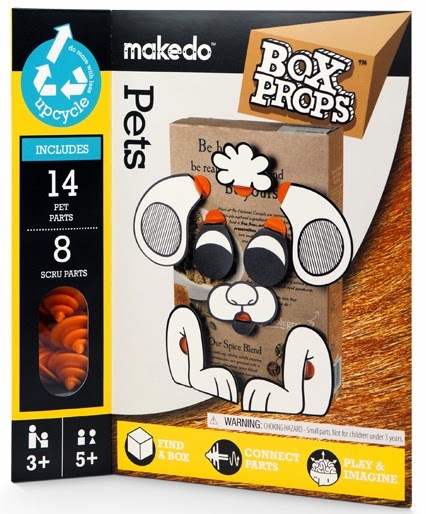 I think the Box Props make an interesting addition to the already amazing Makedo product line. 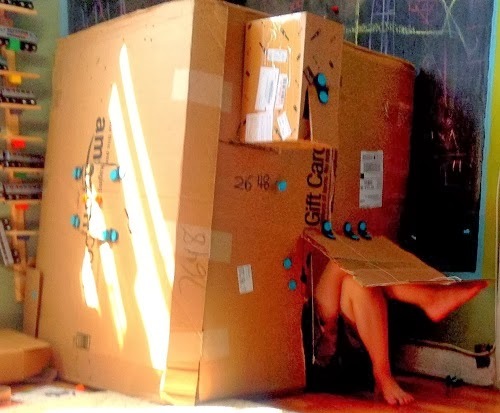 In a sense, the challenge to be creative is larger with the Box Props. You are not trying to represent anything. 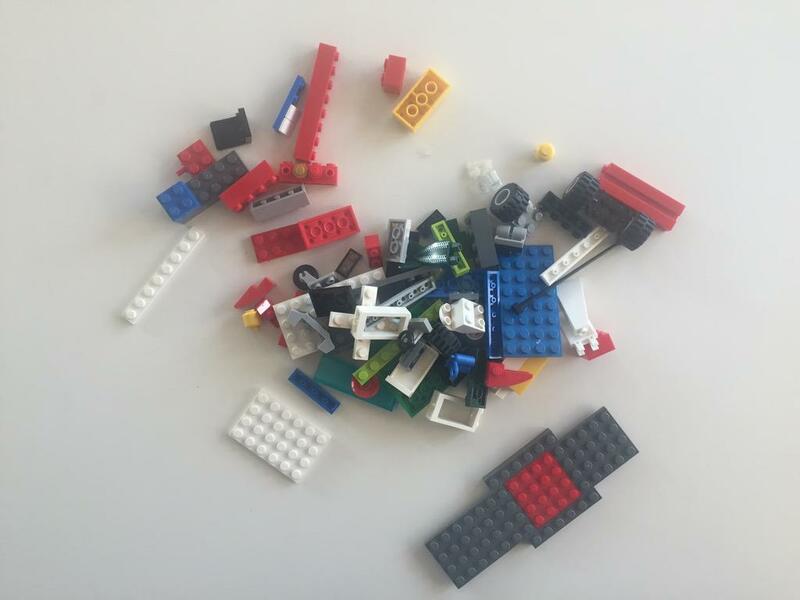 Rather, you are trying to tell a good story with what you've made. 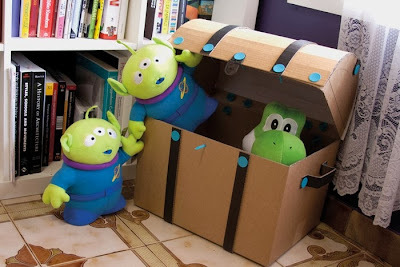 That means that Box Props are great for kids who are great makers but not good storytellers and conversely they're also great for storytellers who are all thumbs in the workshop. It's nice to be able to plan out a face without drawing it or poking the holes first. The Scru can let you play around with body parts. I love showing my kids how moving the eyes around can change everything! It may sound odd but I think the real challenge here, especially during this season is to make do with the abundance shopping online gives to you. I don't know about you but I am thinking I'll be seeing a lot of cardboard boxes this month and next! Believe me when I say that since we received our Makedo Kit for Three this summer, we have never looked at our mail the same way ever again. Like the way the Iron Chefs get their mystery ingredient, the UPS man is practically giving my kids their next challenge. Thus on the days we get a particularly large box, it's now almost a crime to not mess with it. The same sentiment comes out when we get a particularly stiff box. It's painful to NOT do something with good quality cardboard. Knowledge is free at Makedo. There's a whole section on inspirations-with-instructions! This is one of those toys that I really contemplated buying when my kids were toddlers. They loved the mailbox. Wouldn't it have been just awesome for me to have built one for them? Why should kids have all the fun? 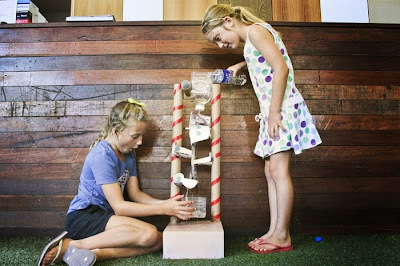 Adults can use Makedo for their little ones and save money (and the environment!) Seriously, just like Woodmobiel, this is a toy that can save you money! 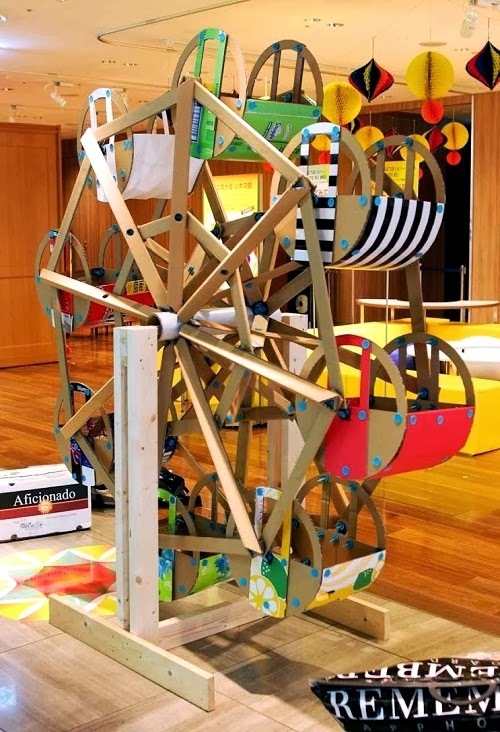 Cardboard Ferris Wheel by Tanaka Satoshi... So I bet you're wondering by now. Who is this man? Here is one clue I found. where I saw a video too. That darn things really does spin! Whoa. 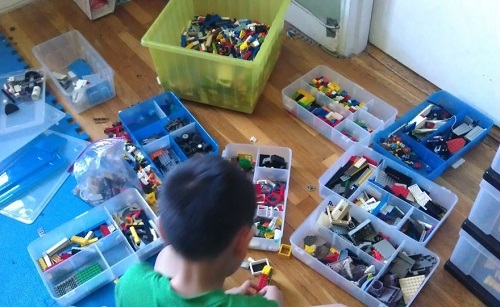 As parents, I think our challenge is to help them make-do with their schedules and give them the space and the time to make something, make decisions you don't agree with, make their vision, make a mess, and even make them figure out when is the right time to throw out whatever they made (because we have to do that too). Our Kit for Three- there is so much. We've never run out of parts! The challenge is not for the kids. We are the ones who have to "make do" and make the space and time for them. No more griping about how storage is too expensive... Click photo to get the making guide! These are our fuzzballs. They needed an apartment. 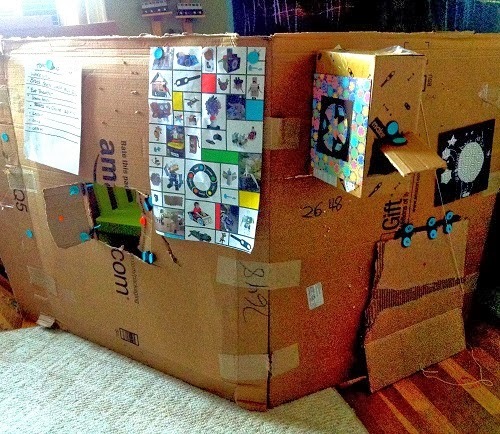 Thanks to Makedo, they have one, complete with bunkbeds and a rooftop pool. Oooh, do I want to decorate you! 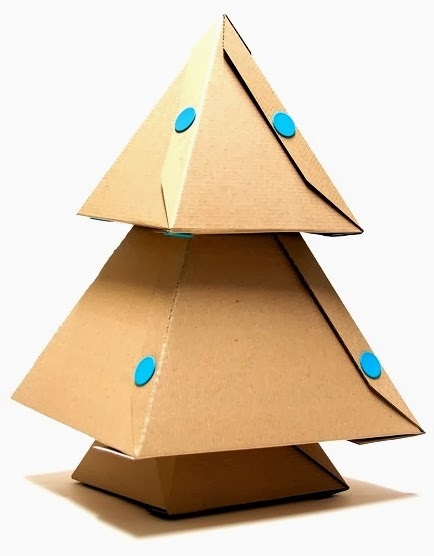 Yup, there is a free making guide for this Xmas tree too! And now try to win your own Kit for One. I promise it will make the holidays a blast especially if you're an online shopper! Think of all those boxes!!! Just fill out the Rafflecopter form below to win a FREEPLAY Kit for One! Want to get it on Amazon? Use my link to support Toys are Tools! Check out these amazing cardboard chairs from the students at the Rhode Island School of Design's Industrial Design Department! If you feel like making do with 2D. 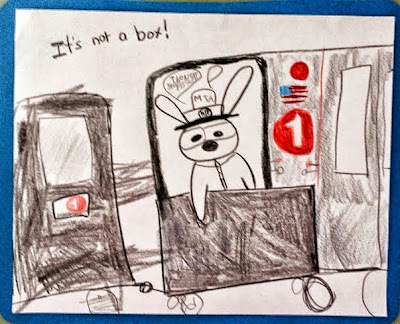 The It's Not a Box Book is perfect! http://mymakedo.com/showcase/view/horsey-bike/all that one was the first pic i saw when i went into their showcase. I know it seems silly to pic the first as something I loved but it was a horse and i thought how my daughter could make that as a dragon. To give you an idea saying my daughter kinda likes dragons would be like saying kids kinda have a lot of energy. I can not wait to see this in action! Thanks to Gianna for sending in these pictures of her awesome cardboard houses of her parakeets! Fry (top) and Amy (below) and the rest of your seven parakeets are very fortunate to be in your family! Not completely off topic but.. please vote for my buddy Rob who created this with his son. http://www.costume-works.com/minecraft_creeper1.html I say this deserves 5 stars even though Minecraft drives me completely crazy! YoBit lets you to claim FREE CRYPTO-COINS from over 100 different crypto-currencies, you complete a captcha one time and claim as many as coins you can from the available offers. Did you think about exchanging with the ultimate Bitcoin exchange service: YoBit.